Fusion chair featuring carved acanthus leafed legs and interesting scrolled carvings on either side of the chair. 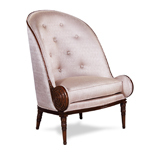 Standard with large simple tufted back. Matches with side table 34092 34326 coffee table, and 34324 2 seater.